Any star, no matter how massive, walks a thin tightrope. On one side is the crushing gravity of the star's own weight, which provides the pressures and temperatures necessary to achieve nuclear fusion in the core and turn hydrogen into helium. But that fusion process releases energy, which puts the star in a more expansive mood than gravity does alone. The game can be played as long as there's fuel to keep the lights on. As long as there's a sufficient supply of hydrogen near the core, the star can keep cranking out the helium and keep resisting the inevitable crush of gravity. I'm not just using a flair of language when I describe the crush of gravity as inevitable. Gravity never stops, never sleeps, never halts. It can be resisted for a long time, but not forever. As a star ages, it builds up a core of inert helium. Once the hydrogen supply exhausts itself, there's nothing to stop the infalling weight of the surrounding material. That is, until the core reaches a scorching temperature of 100 million kelvins (180 million degrees Fahrenheit), at which point helium itself begins to fuse. Hooray, the party's back on! Well, for a while, at least. Helium fusion isn't as efficient as good ol' hydrogen, so the reactions happen at an even faster pace to compete with gravity. While the "main sequence" of a star's life may last hundreds of millions of years as it happily burns hydrogen, the helium phase barely lasts a single million. The problem is that, due to its internal nuclear configuration, fusing iron consumes energy rather than releases it. Gravity keeps pressing in, shoving iron atoms together, but there's no longer anything to oppose its push. In a matter of minutes, the intense gravitational pressure slams electrons into the iron nuclei, transforming protons into neutrons. The small, dense neutron core finally has the courage to resist gravity, not by releasing energy but through an effect called degeneracy pressure. You can only pack so many neutrons into a box; eventually, they won’t squeeze any tighter without overwhelming force, and in the first stages of a supernova explosion, even gravity can't muster enough pull. So now you have, say, a couple dozen suns' worth of material collapsing inward onto an implacable core. Collapse. Bounce. Boom. Except there's a stall. The shock front, ready to blast out from the core and shred the star to stellar pieces, loses energy and slows down. There's a bounce but no boom. To be perfectly honest, we're not exactly sure what happens next. 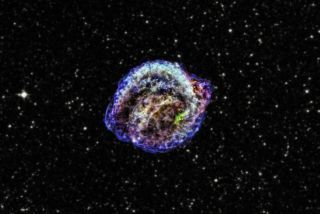 Our earliest simulations of this process failed to make stars actually blow up. Since they do blow up in reality, we know we're missing something. For a while, astrophysicists assumed neutrinos might come to the rescue. These ghostly particles hardly ever interact with normal matter, but they're manufactured in such ridiculously quantities during the "bounce" phase that they can reinvigorate the shock front, filling its sails so it can finish the job. But more sophisticated simulations in the past decade have revealed that not even neutrinos can do the trick. There's plenty of energy to power a supernova blast, but it's not in the right place at the right time. The initial moments of a supernova are a very difficult time to understand, with plasma physics, nuclear reactions, radiation, neutrinos, radiation — a whole textbook's worth of processes happening all at once. Only further observations and better simulations can fully unlock the final moments of a star's life. Until then, we can only sit back and enjoy the show. Learn more by listening to the episode "Why do some stars blow up?" on the Ask A Spaceman podcast, available on iTunes and on the web at http://www.askaspaceman.com. Thanks to @ionut_branea and @ThomasPadden1 for the questions that led to this piece! Ask your own question on Twitter using #AskASpaceman or by following Paul @PaulMattSutter and facebook.com/PaulMattSutter. Follow us @Spacedotcom, Facebook and Google+. Original article on Space.com.